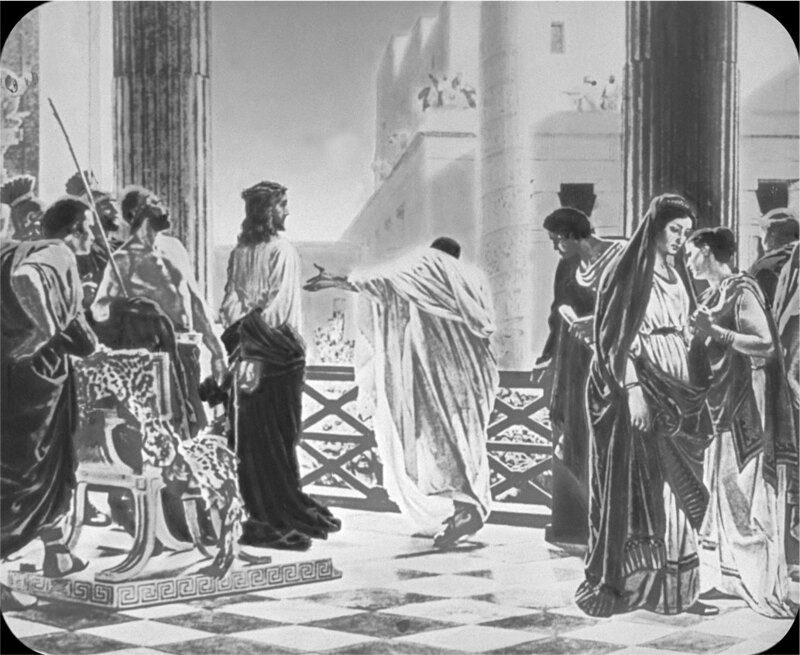 Pilate asks Jesus, "Are you the King of the Jews?" Pilate doesn't fully grasp why Jesus was brought to him in the first place. He deduces that the chief priests were envious of Jesus, so he is looking for one of two things. Either he wants a reasonable charge, worthy of death, brought out against Jesus or he wants to release the man. He's in a no-win situation. So he asks Jesus, "Are you the King of the Jews?" Jesus' reply is enigmatic to say the least. "You have said so." Jesus turns Pilate's question into a proclamation. When you look at the sentence structure in the Greek, it is written as, "You are the King of the Jews?" This could be interpreted either as a question or a sentence. We do this in English as well. For instance, if I ask my daughter, "You are going to bed now?" she would only know that I was asking a question by the tone of my voice. She could answer me, "You have said so," implying a double meaning. Her answer to the question is both a "Yes," and "Your assumption is correct." The chief priests continue to lay accusations upon Jesus. Jesus does not defend himself, but permits His accusers to have their say. Pilate is not impressed with the charges and wants Jesus to defend Himself. So he asks Jesus, "Have you no answer to make?" Jesus continues in His silence. Pilate is flabbergasted at this inaction. Looking for another way out, Pilate hopes public opinion will win the day. Surely all the throngs of people who have been following Jesus will stick up for Him, especially when He is standing side by side with an insurrectionist and a murderer. Yet those who were closest to Jesus have fled away in fear. Urged on by the chief priests, the crowds have turned their back on the messiah whom they cheered into the city only days before. They would rather have Barabbas set free than to have this man who claims to be the Son of God living among them. They want Jesus crucified. In a last ditch effort, Pilate pleads with the people, "Why, what evil has he done?" The crowds shout all the more, "Crucify him!" Pilate succumbs to the pressures that be and delivers Jesus to be flogged and crucified. In this story we see three types of sinners. First, there are the chief priests. Out of envy and unbelief they plot against their king. They cannot accept the claims that Jesus made, so out of hatred, they charge Him with blasphemy. The crowds likewise, follow their lead. The throngs, whom only a few days before were cheering and welcoming their messiah into Jerusalem, are now advocating Jesus' destruction. Then there is Pilate. In one sense, he seems like an honest and just ruler. He doesn't want an innocent man to suffer. Yet when it is all said and done, he is more concerned about himself and maintaining his own power, than distributing true justice. Finally, there is Barabbas. He is a murderer. He has hatred for the Romans. He has so much disdain for the established government, that he is willing to disobey their rules to get what he wants. Violence is not beneath him. He is willing to shed blood to accomplish his agenda. He is the lowest of the low. Yet, he is also the first whom Jesus substitutes His life for. What would you have done? Deep down, how do these sins manifest themselves in your heart? Do store up envy for those who have more than you? Do you hate that person who is always successful? Are you a people pleaser? Are you so worried about your own position in life, that you will do whatever is en vogue to fit in, even if it is sinful? Are you disloyal to the government that God has established as the authority over you? Do you lust after your leader's destruction? Do you applaud the violent and blood thirsty who take control by any means necessary? Each one of us, in our own way, has turned our back on Jesus. Thanks be to God, that Jesus did not turn His back on us. Instead, He went to the cross without defending Himself. He died for your sins without complaint. God's wrath was poured out on Him, for your sake. Then three days later He rose from the dead and He now rules His kingdom from heaven above. One day He will return to judge both the living and the dead. Repent and put your trust in Jesus today. He can deliver you from your sin and unbelief. He died on the cross for you, even though you heart is blackened with sin. He will wash you anew and cleanse you from within. He will give you a new heart. Believe this good news and be saved!